During lunch, we entered the much calmer waters in the lee of Taveuni Island and found a good anchorage. We soon located a tiny harbor on northwest side that is protected by jetties built out of stacked rocks that didn’t look like they could survive any sort of major storm, but that didn’t worry us today. It gave us a perfect quiet landing site from which to start our shoreside visit in the early afternoon. We were met by three “open air” buses and taken on a 1.5 hours-long drive around the island (part ways on a tarred road and part ways on a dirt road) to the northeast side to the quaint village of Waitabu, located right on the coast. We were welcomed by the village people with a traditional Kava ceremony. Afterward, some of us went with local boats to another beach site for some snorkeling on the reef edge, while most of us remained in the village and enjoyed watching some interesting demonstrations put on by the locals showing us some of their traditional activities. We were fascinated by the woman who made tapa cloth from the inner bark of the Pacific mulberry tree. It is a labor-intensive procedure that must take a long time to make finished pieces like the ones on display. The men invited us to take part in the construction of a small structure made of wooden poles and coconut palm thatch. It was a lot simpler than it looked. 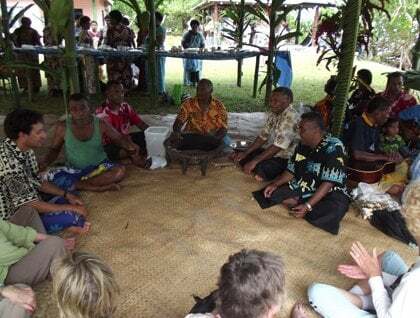 Some of us went on guided tours of the village, while others mellowed out by drinking kava, singing, and dancing with the villagers. 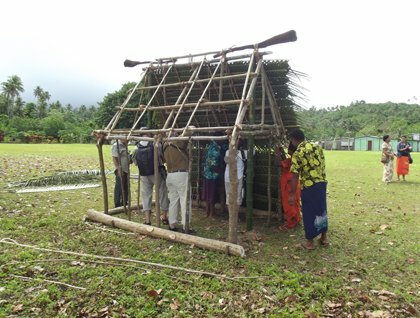 NG ORION guests constructing a small thatched hut at Waitabu Village. From all outward appearances, Waitabu seems a typical Fijian village, but it is actually the center of an impressive new-styled conservation effort. Waitabu (along with three other villages on the island) is associated with the Bouma National Heritage Park of Taveuni Island. This conservation area has given complete protection to the surrounding reef system and the surrounding tropical hardwood forests. This project began about 15 years ago and has produced impressive results. The reef now acts as both a repository and nursery area for highly sought-after food fishes that had nearly been wiped out previously in many areas. From here, they will be able to migrate and restock other areas. 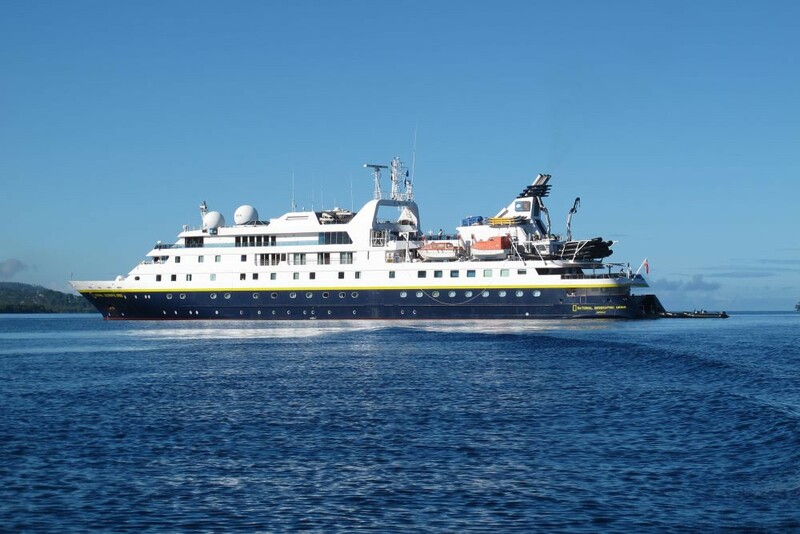 This idea is very similar to what Lindblad Expeditions and National Geographic Society have teamed up together for in The Pristine Seas Project. Bouma Heritage Park demonstrates that small, specially chosen areas, if allowed to flourish, can produce far-reaching effects regarding the health of marine environments, species diversity, and populations. This region will undoubtedly become an important attraction for foreign visitors interested in the underwater world of the tropical South Pacific in the future. It was difficult to pull the last few of our guests away from the village gathering, with its kava, food, and song at the end of the afternoon, but we still had another long drive back to the Zodiac landing. The day finished with a beautiful sunset and the Captain’s Welcome Party aboard ship.